The Malden Public Library’s “Live on the Lawn” Summer Concert Series kicks off on Wednesday, July 11, at 7:00 pm featuring the West African World-Fusion band, Mamadou. 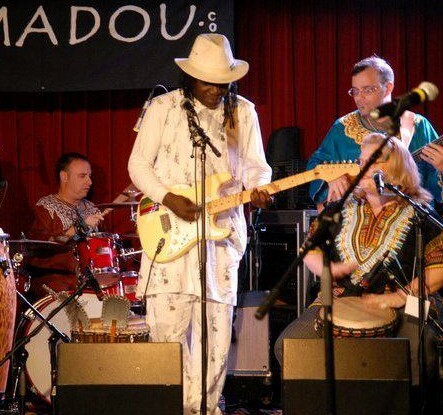 Mamadou is known for their West African and world fusion sound and showcases the original musical works of Senegalese luminary Mamadou Diop. Mamadou Diop has shared the stage and collaborating with African greats such as Baaba Maal, Mamadou Jimi Mbaye and Mbaye Dieye Faye in the Madison Band, Thione Seck, Nicolas Menheim and Papa Seck in the band Africando, and the Grand Soda Mama, among others, Mamadou introduced his signature rhythm guitar sound. Mamadou is one of the most respected rhythm guitarists from his country and an accomplished sabar (Senegalese hand and stick) and djembe drummer. Mamadou Diop has had opportunities to connect with influential giants including James Brown, the Jackson Five with Michael Jackson, Nelson Mandela – all personal inspirations for his art. Now, fronting his own award-winning band, he resides in the USA composing and performing new and amazing songs about peace, love, hope, family and friendship, bringing a positive vibe to our world. The Library’s Summer Series continues on July 18: Squeezbox Stompers; August 1: Knock on Wood; and August 15: Outdoor Movie Night. Bring your lawn chairs or blankets and experience a great night of outdoor live music at the Malden Public Library (36 Salem Street). All concerts are free and sponsored by the Eastern Bank Charitable Foundation, with additional support from the Friends of the Malden Public Library. In case of rain, concerts will be moved inside. For more information, contact the Malden Public Library, 36 Salem Street, at 781-324-0218 or at www.maldenpubliclibrary.org.